October is my favorite time of the year. Not only is it the month of my birthday and Halloween (who doesn’t love a holiday about costumes and candy?!) but it is also when I get to go dancing for nine nights in a row. Yes, I am talking about Navratri! I have always loved dancing in all it’s forms but Garba and Dandiya Raas, the two forms of folk dancing most common during Navratri, hold a special place in my heart. Navratri is a 9 day Hindu festival dedicated to the Goddess Durga and all her incarnations. It is celebrated all across India, but in my biased opinion, Gujaratis (those from the Western state of Gujarat, like me!) celebrate it in the most fun way possible – with dance! The word Garba comes from the Sanskrit word “garbh” for womb or pregnancy. Garba is danced in concentric circles around an image of the goddess Durga or a clay pot containing a candle flame symbolizing the life inside a womb. Even though I am not religious, I love the idea of celebrating the feminine energy. It really appeals to my feminist self! My favorite dance of Navratri is Dandiya Raas, Dandiya, for short. Dandiya is a stick dance performed to emulate a sword fight between the Goddess Durga and the demon king Mahishasur. I start prepping for Navratri weeks before it starts. I start listening to Garba music on YouTube and planning the outfits I will wear on each night. The traditional outfit for Garba is a chaniya chori. It is a long, full skirt worn with a short blouse and a scarf known as a dupatta. Everything is brightly colored or decorated with lots of beads, sequence and mirrors. Since I only have six chaniya choris, I have to plan it out so that I wear my best ones on the big nights and throw in a few sari’s so that I have enough Indian clothes to cover every night of dancing. I rarely got to participate in Navratri when I was a child. It is a common custom among Indian people, especially women, to give up something you love with the death of a close relative. When I was about 7 years old, my uncle died and my mom gave up dancing Garba with his death. Unfortunately for me, that meant that I no longer had anyone to take me to Garba. Since my dad does not dance, I was lucky if I got to go once during the nine days. I longed to go dancing every night. 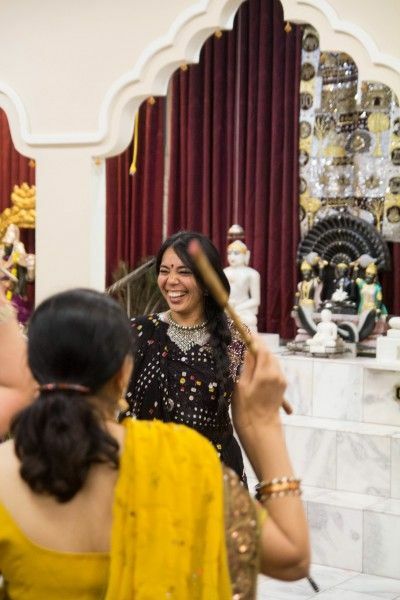 It’s a little ironic that as a person who lived in both India and in America with a house full of Indians, I am only getting to experience the full splendor of Navratri while living with my American husband in San Diego! San Diego is amazing for my Garba love. I found out that the local Hindu temple has daily dancing (I think most others only do once a week) and the local Gujarati Association holds two big event nights. This year the first one was at a gymnasium at Alliant University and the second was at the San Diego Convention Center. Aside from the larger Saturday night ones, we try to go to the temple every night. I love my husband for putting up with the exhaustion, foot pain, and rug burn that comes from 11 straight nights of dancing while still working the normal amount during the days. He is awesome! Typically we start a night of dancing with the dances called Garba. There are two basic types of Garba, the “be tali” meaning two claps and the “traan tali” meaning three claps. The claps tie into the rhythm of the dance. I usually tend to skip the be tali portion of the night because it is my least favorite part. I do enjoy the traan tali though and try to make it in time for that. But more than anything else, I love Dandiya the most. It always comes last. After the traan tali, there is usually an Aarti – a worship ritual that involves offering a flame to the deity. Following which, there is often a break for eating Prasad, food that has been blessed by being offered to the deity first. At the temple, we get to eat lots of delicious home cooked food that is donated by people. Yum! After the Prasad break, it’s time for Dandiya! 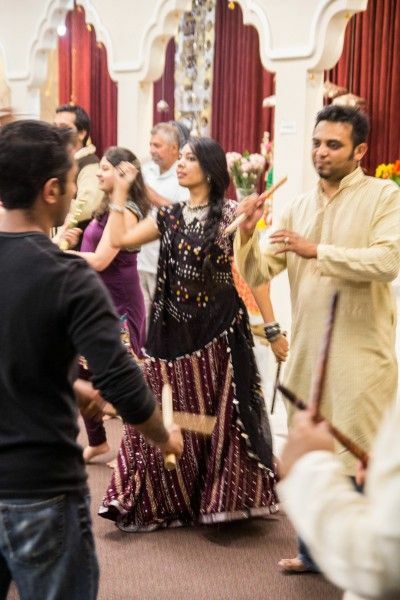 In America we tend to dance Dandiya in two long, opposing lines, by hitting your sticks to those of a partners in specific steps and then moving on to the next partner. In India, we used to form two large circles facing one another. One went clockwise and the other counter clockwise. I guess the difference was in India we would dance in open places like parking lots or cricket grounds and here it is often in large, enclosed rooms. The Dandiya starts off with a relatively slow beat and builds as it goes. I love the build up! It’s so freeing to just let the beat dictate the speed of my movements. I go from performing the steps slowly to dancing them faster to outright jumping with every beat. So fun! The Convention Center nights are huge, about 1500 to 2000 people show up. They usually involve a professional band and super loud speakers. I really enjoy dancing at the temple because it’s low key and the band is fabulous despite being made up of non-professionals. They usually have two live singers (a male and female), a dhol player and a keyboard player. And they are really good at building tempo. I found this tutorial on YouTube, it’s great for the basic steps if you want to learn how to do Garba and Dandiya. Comments on "Nine Nights of Dancing for Navratri"